I have been a fan of the KOF games for a long time now, so to say that I was eagerly awaiting this game would be an understatement. From the moment I saw the first shots of it before it was released I just couldn't wait to play it. Before I actually did though, I had heard lots of stories from people saying that it really wasn't that good or just "not as good as KOF '98". Well I would like to go on record and say that I think that is a bit harsh. KOF '98 is an awesome game overall and very hard to follow up, but I think '99 is a solid game that does some new things, even if it does a few that weren't popular with many fans. The game kicks off with a short but nice intro with some cool artwork. In fact, one of the first things that you will notice is that the artwork has been improved tremendously. 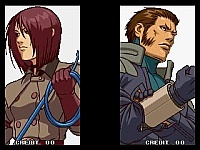 In KOF '98, the intro screen looked great, however the portraits of the characters in game and on their victory screens were not quite so good (they were apparently not drawn by the same person responsible for the intro). 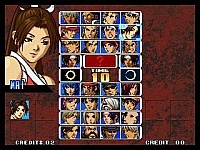 In KOF '99 the portraits of the characters look excellent. I read in one of the FAQ's that this time the guy responsible for KOF 98's intro screen drew everything. There is a little animation that briefly flashes up with pictures of your team's characters when you win and looks quite flashy too. This game definitely ranks up there with Last Blade 2 for overall presentation on the Neo Geo as far as I am concerned. There are now 7 teams to choose from, with four characters in each. "Why four characters in each team?" I hear you ask. Well, you choose three people to fight with as usual, but now you also choose an extra character called a "Striker". At any time during a fight, you can call the Striker in to help you by pressing the B+C buttons together. What the Striker does depends on which fighter you chose. For instance, some just attack (like Terry) and others actually heal you and give a tiny portion of your energy bar back (like Athena). Some characters are better Strikers than others, so choose wisely (see the FAQ's below). I find this to be a fairly cool feature, although it doesn't really play a major part in the game. I didn't find that there was a great potential for using the strikers in combos. It all depends on whom you pick really. As far as I am concerned, this is definitely the best of the series graphically (at the time of writing at least). 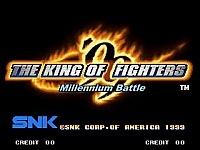 The King of Fighters games have always been nice to look at and this is no exception. The fighters themselves look great and as I mentioned at the start of this review the artwork and presentation are all top notch. Apart from those, the one thing that I think stands out are the backgrounds. Some of these look really great and they change as the match progresses. For instance, on one stage it starts off sunny, with lots of people standing in the background. On the second round, the sky has started to become cloudy with the occasional raindrop falling, and gradually that rainfall gets heavier, while most of the people have disappeared. By the third round, the heavens have opened and the rain is falling very heavily, which looks cool. On all of the stages that you fight on, there are changes like this between rounds. The level of detail is quite impressive and I would say that this game is probably pushing the ageing Neo Geo to its limit. The King of Fighters '99 lived up to my expectations. I don't really consider myself an expert at any of the KOF series and other people that play them more than I do will probably pick faults with it. As I mentioned earlier, some people have said that they prefer the earlier games. Everyone is entitled to their own opinion and mine is that this game ROCKS ! It may not be revolutionary and it may not have anything that is really all that new or different to the other KOF's, but at the end of the day it is good fun and looks and sounds great. Not bad for a system that is as old as the Neo Geo!